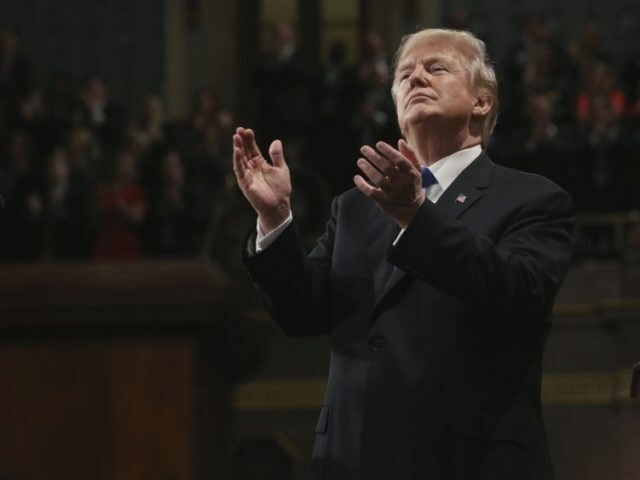 President Donald Trump emphasized the importance of eradicating the Islamic State during his first State of the Union address Tuesday night, taking credit for the group losing nearly 100 percent of its territory in Iraq and Syria. Trump’s claim that 2017 was a watershed year in the fight against ISIS is a correct one. The group lost its two “capitals” – Raqqa, Syria and Mosul, Iraq – and has been largely relegated to an online cult driven by aggressive young men attracted to the gore of jihad. In celebrating the progress made against the Islamic State, however, Trump failed to update America on how the allies that made these sweeping victories possible are currently faring and how the Trump administration is letting them down. The Kurdish forces allied with America – in Syria, the People’s Protection Units (YPG) and, in Iraq, the Peshmerga – played an outsized role in defeating ISIS in both countries. For their troubles, they are facing invasion from Turkey and Iran-backed anti-American militias, respectively, and received little attention or care from Washington. Trump did not present to the American people any concerns about the current state of affairs in Iraq and Syria, instead applauding the easily-reversible progress made so far. Trump was right to note the magnitude of what destroying the physical “Islamic State” would do to defeat the terrorist group entirely. In addition to being one of the clearest-cut examples of Trump keeping a campaign promise, it undermined ISIS’s heavily reliance upon ancient prophecy that revolved around geography. Controlling Raqqa, Mosul, and, particularly, the town of Dabiq was a major marketing ploy for the terrorist group. Dabiq, ISIS terrorists claimed, would be where the first battle of the Apocalypse would begin, leading to the ultimate destruction of the West and triumph of Islam around the world. When ISIS lost that battle, its claim to being the premier jihadist entity in the world collapsed with their control over that town. Trump also celebrated a guest who had fought the Islamic State in Raqqa, Army Staff Sergeant Justin Peck. Peck saved the life of colleague Kenton Stacy, injured clearing bombs out of a hospital. The remarks highlight the struggle of rebuilding formerly ISIS-controlled areas long after the battles are over. The U.S. military is playing a role in making Raqqa safe for its displaced civilians. The head of U.S. Central Command, Gen. Joseph Votel, visited the city just last week to assure allies there that Washington is committed to rebuilding. Yet the city is largely in the hands of the Syrian Democratic Forces (SDF), a multi-ethnic coalition largely made up of YPG fighters – the same YPG that American officials insisted Turkey had “legitimate security concerns” in attacking last week. Turkish President Recep Tayyip Erdogan announced an invasion of northern Syria, specifically to destroy the YPG, this month, following a Pentagon announcement that the YPG would participate in creating a “border security force” to prevent ISIS sympathizers from entering Syria through Turkey and restoring the terror group’s numbers. Erdogan has branded the YPG a “horde of murderers” and deployed to Afrin. The State Department responded by denying that such a “border security force” was in the process of being created. “We’re not in a crisis,” the Pentagon insisted. Turkish officials lied about killing non-existent ISIS forces in Afrin, while Defense Secretary James Mattis said the NATO member nation had “legitimate security concerns” about the YPG. The YPG has largely prevented the sorely depleted Turkish military from advancing anywhere in Afrin, but Erdogan insisted the next stop on the Operation Olive Branch tour is Manbij, where Turkish forces would collide with U.S. troops. President Trump has yet to definitively weigh in on the situation. Trump did weigh in in Iraq, where the Popular Mobilization Forces (PMF), an Iran-backed militia coalition containing forces that have threatened to kill Americans, attacked the Peshmerga in October. “We don’t like the fact that they’re clashing. We’re not taking sides, but we don’t like the fact that they’re clashing,” Trump said of the skirmish in Kirkuk, triggered by Iraq’s Kurdistan Regional Government (KRG) decision to hold a non-binding referendum on independence. Only Israel and, tentatively, Russia, supported the KRG’s decision to hold the vote. The United States sided with Iraq, Iran, and Turkey in opposing the move. In response to the vote, the PMF attacked Kirkuk, which fell into Kurdish hands after ISIS attacked in 2014 and the Iraqi army fled. The Peshmerga stayed, fought, and won. The Iraqi government now controls Kirkuk again after having legalized the PMF, a necessity given the ongoing failure of its armed forces. The Peshmerga, counting on no support from the United States or any international allies, withdrew from the city. The day after the PMF attacked, Islamic State fighters returned to Kirkuk. Last week, ISIS attacked a PMF post in nearby Salahaddin province. The PMF reportedly lost two of its fighters to ISIS on Monday. The victories against ISIS Trump celebrated on Tuesday are fragile. Achieving them was impossible without Kurdish forces, and the trend in Kirkuk appears to indicate that preserving them will be, too. Without a robust Kurdish force to keep the peace in territories where the Syrian and Iraqi national armies have failed, the Islamic State and other terrorist organizations will thrive. History has taught America this. Americans deserve to hear from their President not just when we win, but about how we will preserve those victories, and how we will stand by the allies that made it possible.